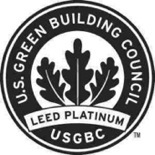 I recently added newly certified Platinum-rated projects (buildings, homes, offices, and stores) to my online listing of LEED Platinum Certified Building Projects Worldwide, which I had last updated a year ago. The listing is organized by country and—within the U.S.—by state. Some of the listed projects are linked to online case studies. The listing includes projects of all types, from every LEED rating system: New Construction (and Major Renovations), Existing Buildings/Operations & Maintenance, Neighborhood Developments, Commercial Interiors, Core & Shell, Homes, Schools, and Retail. As of my latest review of the data (at the beginning of January 2012), it appears that there are now more than 1,045 LEED Platinum rated projects worldwide. While the vast majority of these LEED projects—about 950 of them—are located in the United States (where LEED was created), Platinum rated projects now exist in 25 countries; a year ago only 16 countries had LEED Platinum rated projects. The nine countries that gained their first LEED Platinum projects over the past year are: France, Hong Kong, Italy, Japan, Mexico, the Netherlands, Switzerland, Taiwan, and Turkey. The other countries with LEED Platinum projects are: Australia, Brazil, Canada, China, Finland, Germany, Great Britain, India, Saudi Arabia, South Korea, Spain, Sri Lanka, Sweden, Thailand, the United Arab Emirates, and of course the United States. After the U.S., India is the country with the most Platinum projects, with about 35 projects so far (up from 20 a year ago). Canada and China also have many Platinum projects. Within the United States, 49 of the 50 U.S. states (all states except North Dakota)—plus Washington D.C. and Puerto Rico—now have building projects that have achieved the LEED Platinum rating. A year ago, Alabama and West Virginia did not yet have any LEED Platinum projects, but now they do. The range of Platinum project types is very broad. In addition to high-profile projects (such as the iconic TransAmerica Pyramid in San Francisco, which got the Platinum rating for its upgrades under the LEED for Existing Buildings: Operations & Maintenance rating system) and a number of high-end offices, retail spaces, and luxury residences, LEED Platinum projects also include several public buildings and many modest homes and affordable housing developments. For example, there are dozens of Habitat for Humanity-built LEED Platinum homes around the country, and more than 75 affordable Platinum homes built in New Orleans alone through various initiatives, including Make It Right. * Another green building certification, which is widely considered to be an even higher bar to reach than LEED Platinum, is the Living Building Challenge. To date, four projects have achieved the Living Building Challenge certification: the Tyson Living Learning Center in Eureka, Missouri; the Omega Center for Sustainable Living in Rhinebeck, New York (which also got a LEED Platinum certification); and the Eco-Sense home in Victoria, British Columbia. The latest project to achieve this certification (along with a LEED Platinum certification) is the Hawaii Preparatory Academy Energy Lab in Kamuela, Hawaii. I just wanted to say great job on adding the disclaimer to the 2011 data that there is updated data. I haven’t seen that before and as a college student looking for reliable, up to date information, that was very helpful, not to mention the great information compiled in the article.